If you have a smart TV which have network connected and support UPnP/DLAN (most smart TV since 2012 which have network connect support this), you can use this App to stream your media files to your TV. 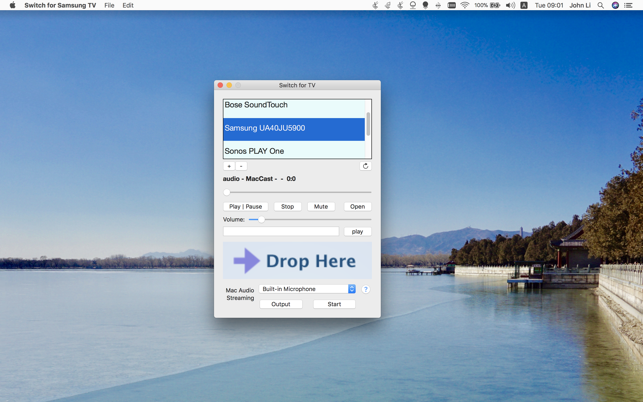 Just drag and drop media file to the App bottom image or click on open button to select a file, it will play on your big TV screen, it support photo, music, and video, you can even enter a Radio Station URL to play the internet Radio Station on your TV. Cast your Mac microphone or system audio (need extra free system extension) to your TV speaker, there may have several seconds delay to start the audio cast. The format of video/audio/photo is only limited by your TV support, most common format ( mp4,avi,mkv,rmvb, mp3, jpeg ) should be all supported. Support more device, include Roku TV/Streaming Stick, Steam Link (with Kodi installed), Amazon Fire TV ,Bose SoundTouch and Sonos speaker. We can't test every UPnP/DLAN device, so please tell us this App works with or not with your device and help others, you can write that in App review or email us xuecsapp@gmail.com , thanks very much! Samsung Smart TV does not register the laptop and vice versa. Same network, and unless i’m doing something wrong it doesn’t seem to come with any troubleshooting Help. Doesn’t connect properly to Bose Wifi Soundtouch, Soundtouch connects direct to laptop but when using app none of buttons work. For Bose Sountouch to work, must hit Output on the App then goto the sound settings. Volume control has to be adjusted through settings as well. Wasted my money, how do i get a refund? Hi, please turn your TV to HDMI or smart hub mode to give a try. You don't need connect SoundTouch to your Mac since SoundTouch is WiFi speaker. The App will automatically find your Smart TV and SoundTouch if they are setup correctly in the same network. If they didn't show up, it's possible your network/router disabled UPnP discovery. Please send us email xuecsapp@gmail.com if you need help. I had this but since the latest upgrades of Samsung and Apple it does not work!